Vin Jaune has to be one of the more challenging classic wine styles out there. The famous ‘yellow wine’ of the Jura is an obscurity in the scheme of things, a white that is stylistically close to fino sherry – crafted with the aid of the ‘veil’ of flor-like yeast – yet built without fortification. What makes Vin Jaune even more unusual is that it ages. Marvellously. In fact, Caves Jean Bourdy have some 50 vintages in the cellar and a whole swathe of vintages available for purchasing, right back to the 19th century. I’ve been lucky to try several Vin Jaune over the years and every time I’ve wondered how such a plainly weird wine gained much traction at all – purely because of how different to the usual ‘fruit based’ wines we normally drink. It’s that same thought about how we first started to eat vegemite, or which idiot thought that eating highly toxic puffer fish would be smart. But perhaps that weirdness is part of the appeal – it’s compelling in its own way. 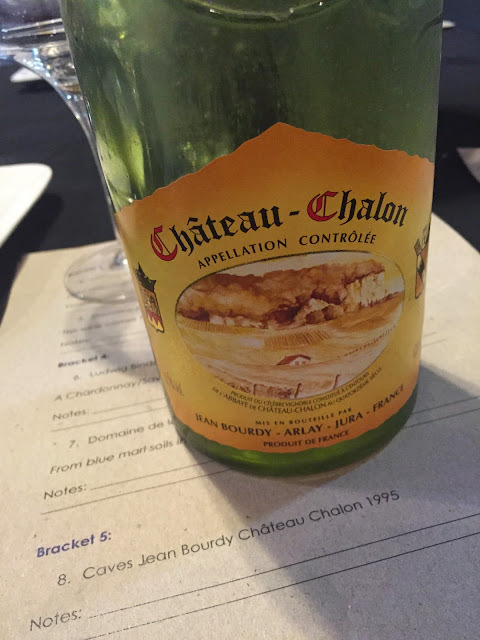 This particular wine comes from the Chateau Chalon appellation – a hilltop within the Jura region solely devoted to Vin Jaune production. The equally obscure (until a fuckup at the CSIRO brought it to Australia) Savagnin is the grape variety here, the grapes late picked, fermented cool, and then put it into half full barrels for ageing, with the wine not able to be released until seven years after harvest. Here, we see an extra decade in bottle serving to dial up the weirdness even more. It smells, well, wild – a nose of farmyards, cheese and hay and fungus. Old cheese, oxidative weirdness, flor-like mothball funk. The whole kit and kaboodle. Yet alive too. The fetid palate has a smorgasbord of sour, cheesy flavours, that flor-like tang a polariser, backed up by equally high acidity. The most intriguing flavour that Vin Jaune gives out though is curry powder. ‘Curry spice’ it is called and this had it in droves. Spicy, fresh-ginger like ‘warmth’ and sour, yet creamy, tang that sort of chases you through the finish, just to up the weirdness again. Ultimately, I’m still not sure how you drink much of this stuff. I’ve had slightly richer Vin Jaunes that are more palatable, more easy, but this feels the most rustic – and almost more genuine because of it. A wine to challenge, but also revel in its wonderful winey weirdness. Score: 18/20, 93/100. Score is kind of hard here though.